The last couple of issues we have talked about how to train some of the least favored muscles of the body but now we are going to talk about what is surely the most favorite part of the body for many, the arms. We used to have an old saying in the gym that said, "curls are for girls." The explanation of this saying is that while well-developed biceps are impressive to look at they are not nearly as important as other parts of the body when it comes to strength and power. I guess it is all in the eye of the beholder and women certainly do seem to admire big biceps so hopefully the exercises below will give you some arms in which you can be proud. Your arms are comprised of several muscle groups the most visible of these being the Biceps, which are the muscles on the front of your upper arms, and the Triceps, which are the muscles on the backs of your arms. Your lower arms contain the Brachioradialis muscles and the Wrist Flexor muscles. Detailed below are some of the exercises that can be employed to develop these different muscles of your arms. Curls are the favored exercise for many because they develop the showpiece muscles of your arms, the biceps. 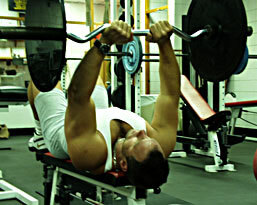 Performing the exercise is as straightforward as it gets since you simple curl the weight from the extended position as shown in the first picture below up to your chest using your biceps. The advantage of using a curl bar as shown in the pictures above is that the angle of your hands more closely approximates a natural angle and places more stress upon the biceps muscles. 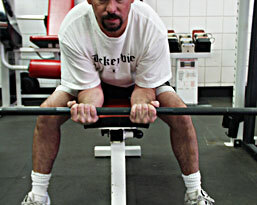 Some people still prefer to use a straight bar like the one in the second picture below which will also provide good overload to the biceps muscles. The disadvantage in using a straight bar is that greater stress is placed upon the elbow joint which can cause some people irritation in the elbows. Alternating Dumbbell Curls & Concentration Curls are variations of the curling exercise that utilize dumbbells which can provide a greater isolation of the biceps and promote greater growth. 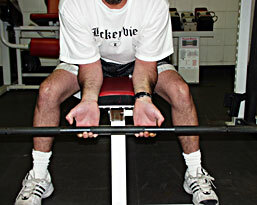 Alternating Dumbbell Curls are performed by alternating from one arm to the other and greater isolation of the Biceps can be achieved by slightly leaning into the raised arm as shown in the first picture below. Concentration Curls help to better isolate the biceps by eliminating the extra movement associated with standing exercises. 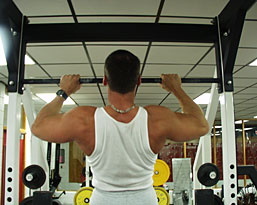 Pull Ups are useful for developing the Biceps muscles however this is a complex exercise that involves several other muscle groups like the lattissimus dorsi muscles of the upper back. The key to getting the most development in your Biceps with this exercise is to use a narrow grip as shown in the pictures below. Since Pull-Ups do not isolate the biceps in the same way as a curling exercise they should not be your only choice for developing your arms but can be very useful when properly coordinated with other arm exercises. Triceps Extensions are used to develop the muscles in the backs of your arms. 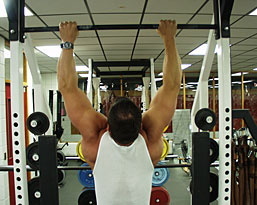 The exercise is performed by pressing the bar from a position just above your head to an extended position as shown in the pictures below. The key to perfoming this exercise correctly so as to provide the maximum isolation to the Triceps muscles is to make sure your elbows remain stationary during the performance of the exercise. Dumbbell Triceps Extensions are a variation of Triceps extensions that use a dumbbell instead of a barbell which allows for a greater range of motion during the performance of the lift. 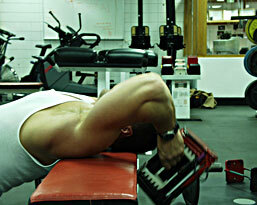 Triceps Pushdowns are a way to train the triceps muscles using a machine. There is no real advantage over Triceps Extensions or Dumbbell Triceps Extensions as far as isolation goes but the lift is a little easier to perform due to the inherent advantage of the machine. The key, as with the other triceps exercises is to minimize the amount of movement in your elbows so as to properly isolate the target Triceps. Dips can provide a great deal of overload to the Triceps but it is important to understand that this exercise is complex since it involves several other muscle groups like the pectorals of the chest and the anterior deltoids of the shoulders. Performing the lift is fairly simple. You start in an upright position with a slight bend in your elbows. You lower your body by bending your elbows until the back of your arms is perpendicular to the floor. You then press your body back to the starting position. Most experienced lifters use a belt that can hold weight and increase the intensity of the exercise and provide a greater overload to the Triceps. Wrist Curls are useful for training the Wrist Flexor muscles in the lower arms which extend down the lower arms into the wrists and fingers. The key to maximizing the intensity upon the target Wrist Flexor muscles is to allow the weight to lower to the fully extended position of the fingers as shown in the first picture below. 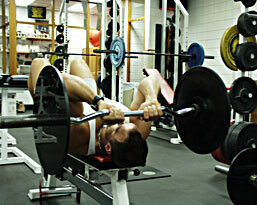 The above exercises are some that can be employed to develop the muscles of the arms. The exercises are fairly straightforward and easy to perform but as you can see from the variety of exercises we presented there are many variations on the same basic exercises. You will undoubtedly see even more variations in the Gym but the basics of performing any of these variations has been covered above with respect to properly isolating the target muscles so choose ones that you are comfortable with and then perform the exercises in the proper manner. Well-developed arms definitely make an impact aesthetically so train your arms in the same way you train the other parts of your body utilizing the basic principles of training like Specificity, Variation and Periodization.